So what am I going to talk about in my slot. The whole conference is right where I am interested in talking about things, the theme being “Old Myths and New Realities – The New Realities of Virtual Reality in the Old World.”. With the cast there I feel a little pressure to keep up. It is odd but when you are thrown in the ring with the people who you have been influenced by and whose work and thoughts you respect, with an audience who is well informed and educated on the subject, it becomes a different discussion to the usual evangelical one of “hey this really is a good idea people!”. I want to build on my washing away cave paintings and where my current thinking is with how we are already changing things quite dramatically for society. So I was planning on this. 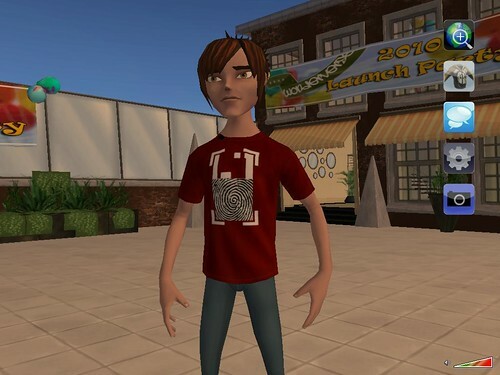 Synopsis: Virtual worlds have already acted as a disruptive technology and combined with other web movements have caused a positive social disruption to all parts of our lives, work politics and friendships. However many people are already scared by our new ways of communicating and interacting. 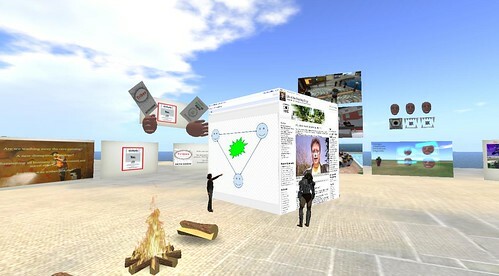 Yet have we, as virtual world exponents, already got too comfortable with avatars and islands? Should we be considering where we go to next layering and combing real and virtual. How do we start to thread our online existences? Is there another step to take in the not so distant future that lets us communicate our ideas online in ways we have yet to evolve to consider. Quite often things come up as I am presenting, its sort of an adlib performance as I am not big on writing scripts and sticking to them. If there is anything anyone wants to ask beforehand or see me weave into this then let me know here or on twitter etc. I have just popped in and signed up to Wonderverse. 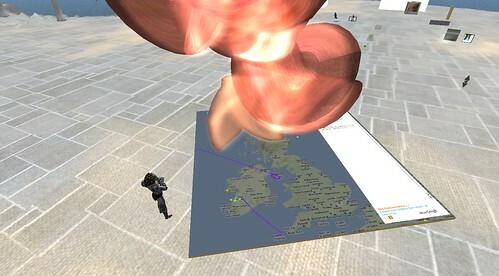 http://www.thewonderverse.com a new virtual world application. It is good to see new ones appear as we have lost a few recently. It is, of course, still an early beta, but (aside from being a windows only app) its quite a stylish look. The avatars are elongated cartoon style. Chat is by chat bubbles over head and a range of emotes using / or right click are available. It certainly plays a lot of music. I am not sure what streaming service it is attached to or where the music is from but its a pretty good selection. Today I cut a video for a conference presentation, that may or may not make the cut. However I was happy with my 5 minute monologue. A single take I might add! Edited it all up threw up some overlays and viola. Its about AR, where that fits with virtual worlds and 3d printers. Obvious really. Don’t they test software anymore? This is not a rant about the constant patching of my PS3 everytime I turn the thing on, nor about the minor updates hear and there in various operating systems and platforms. Well actually it might be, but its not intended to be rant at all. 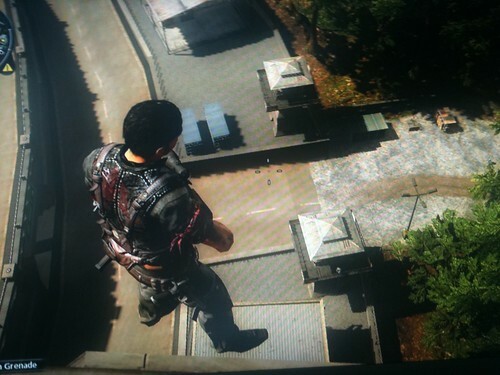 Whilst playing the wonderful Just Cause 2 on the Xbox I bumped into a few bugs and glitches. They all happened around the large radio antenna dish up in the mountains. The first saw me accidentally get inside of the buildings. The buildings tend to be texture walls to climb so once you are inside they seem to be invisible as there is not texture to render. This was amusing until I realized I could not get out at all. I was not able to spoof an evac and had no ammo to self harm so I had to quit 🙁 Still these things happen. I then popped back to the same place and found a little glitch with the top edge of a building. i.e. I am standing on nothing due to some odd collision detection. For me I do not regard these are terrible flaws but it does raise the question of how, with such large expansive experiences it is ever possible to get enough test coverage and QA in place. Just Cause 2 has 400 sq miles of terrain, trees, building water. Vehicles moving around. Clearly the physics engine can be tested with a relative few vectors but when the place is built by hand, building placed its almost impossible to not have a few errors in place. Equally with a free roaming game its hard to tell when something is a bug. I had driven a speed boat straight at a yacht. The speed boat was forced underwater with me still driving it, I had a submarine in effect. That is less of a bug a more an unintended consequence, the thing was it then became my mission to try and recreate it, which I eventually did. Testing and coverage is actually not an instinctive thing to do as I have found with some clients. Where an atomic action happens with the same start and end conditions, but where it is held in a different part of a flow or sequence each time it is not always so necessary to run a test for every permutation and combination. Test the changes, test the extremes and test the critical path. The software I used to build way back for internal corporate systems testing was a straightforward job in many respects, as we started to get more and more service, more and more permutations and many more functions it clearly has got a lot harder. It is why I am not surprised that some tests really don’t get done in favour of patch later over the web, though at the same time I suspect some don’t get done because “hey we can patch it later”. Anyway I am not moaning about Just Cause 2 as I am still in awe of its size and scale, just as I am with GTA IV and will no doubt be with Red Dead Redemption. Free roaming FTW! Digital Economy Bill – UK politics inaction or in action? Anyone who has not been following the massive debate online with #debill hashtag will have missed a horrendous hole in our democratic system here in the UK. Of course those that have missed it are probably the MP’s that decided not to bother responding to the thousands of letters and decided not show up in the house for the debate and vote. Why is this such a travesty? The Digital Economy bill is an all encompassing set of rules, regulations and ideas bundled together that have a huge impact on the way we in this country have access to the internet. Of course something this important and with this amount of impact needs full democratic discussion and our representatives need to be able to consider and amend what is contained in it as the internet is the live blood for the next century. However, this bill that has generated so much protest against it, has been steamrolled through parliament when most people were not looking as part of the wash-up process of a general election campaign. Wash-up is designed to continue the business of government whilst they all persuade us to vote for them in the next month. What is amazing is that until this morning (after the bill had been rubber stamped) was the first mention of it I have seen on the TV. It was on BBC breakfast and only really had a spokesman for the bill not anyone against it. So, those of us who live and work on the web have been pretty fully engaged with the politics of this bill, and yet I have seldom seen anyone speak out for it. Amongst the more contentious issues are the ones about disconnecting pirates from the web, more importantly disconnecting anyone whose internet service is used by a pirate or anyone deemed to be a pirate. One government minister suggested this would be ok as we have passwords! When the apparently reasonable argument is put forward that people need to be paid for their creative endeavours and people should not take their work for free one can say it sound good to put things in place to deal with that. However when that potential vested interest ends up removing our ability to use the web in a creative way, when the controls are seemingly in place to maintain the status quo of large record companies and alike to not adjust to the future and to new business models we have to ask if these controls are the right thing? Forcing service providers to police all activity of all users at all times just in case a song is downloaded will not only eat into our civil liberties but also our wallets. Someone is going to have to pay the ISP’s to monitor and police the communication channel. That will be us the consumers and businesses that need the web to exist. Another platitude that has been bounced around is “we will have these powers but we wont use them”, a seemingly self defeating argument. I think we have seem a major #fail on many counts with this bill though. We have had a failure to debate and challenge the flawed bill by our soon to be unelected representatives. We have seen the rules abused to push something through the system and we have had an apparent media blackout on the subject. At the same time we have seen a massive public debate online and one that in the coming election I think will rise to the surface. After all why only make decisions about things once every 5 years with a cross on a piece of paper when we have instant live communication with one another and our representatives? So to the thousands of fellow internet users who have felt so strongly about this, and like me have ended up writing to our MP’, tweeting, blogging, signing petitions etc. I think we have actually proved a point to ourselves about the value of the MP’s in this country. This is the start of something I am sure!